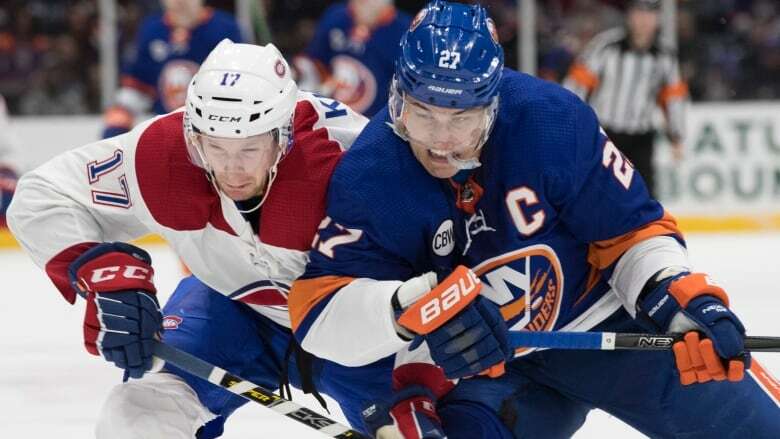 Anders Lee scored the tie-breaking goal late in the third period and Thomas Greiss stopped 33 shots as the New York Islanders beat the Montreal Canadiens 2-1 on Thursday night. The New York Islanders have been winning this season thanks largely to stalwart defense and strong goaltending. A timely goal from their captain also proved huge for their playoff push in another close victory. Anders Lee scored the tiebreaking goal late in the third period and Thomas Greiss stopped 33 shots as the Islanders beat the Montreal Canadiens 2-1 on Thursday night. Defenceman Adam Pelech also scored his fifth goal of the season in the second period to help the Islanders win for the fourth time in five games to remain two points behind first-place Washington in the Metropolitan Division. New York has 12 games remaining, one more than the Capitals. "It's so important to get these two points especially against a team like Montreal," said the 24-year-old Pelech, who has had a breakout campaign on the blue line with 17 points. "We had plenty of guys who stepped up tonight and Greisser played a great game." JordieBenn had the tying goal for Montreal late in the second, and Carey Price finished with 36 saves. Lee converted on a 2-on-1 with Matthew Barzal for his team-leading 25th goal of the season with 2:57 remaining. Lee waited patiently for Barzal to pass him the puck at the edge of the left circle before whipping it past Price. Lee, who became the team's captain this season following the departure of John Tavares, has seven goals in the last 13 games. Barzal's assist was his team-leading 39th. "This is the kind of hockey and tight games we're going to see the rest of the way," Lee said. "These are the tight games you have to have." 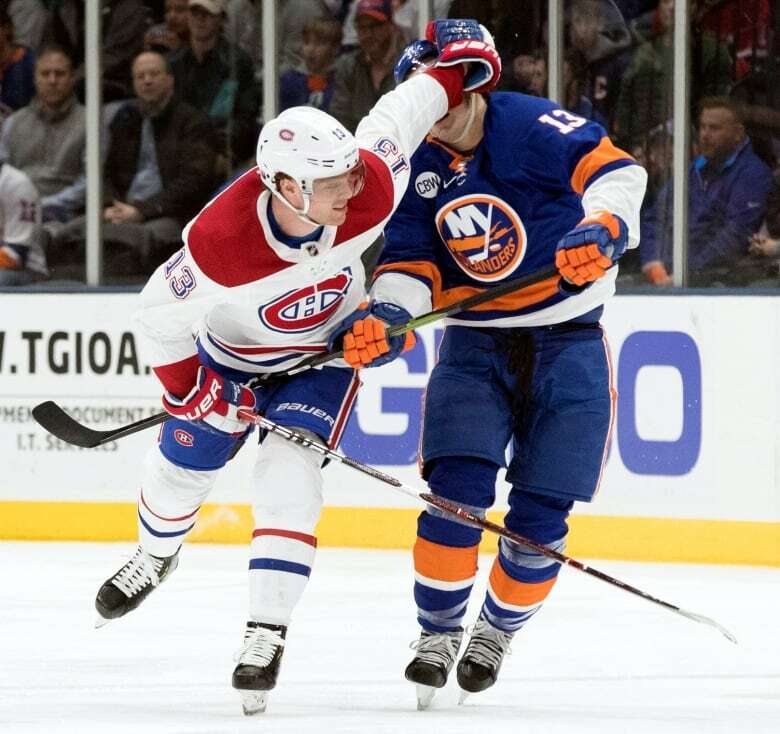 The Islanders followed up their shutout win over division-rival Columbus on Monday with another solid defensive performance against the speedy Canadiens. "We got a chance in the third and we buried it," Islanders coach Barry Trotz said. After a scoreless first period, Pelech put the Islanders ahead at 1:20 of the second. Brock Nelson and Andrew Ladd assisted. Benn tied it with 1:50 left in the middle period when his shot from the left point eluded Greiss. Paul Byron and Nate Thompson assisted on Benn's fifth of the season. The teams played a brisk playoff-type game with both Griess and Price making acrobatic saves at both ends. The Islanders outshout the Canadiens 15-9 in the first. The Canadiens had a 16-14 shots advantage in the second. The vibrant play continued in the third as the teams traded chances before Lee's heroics. The Islanders are 27-10-3 in their last 40 games and now a season-high 19 games over .500. They have already surpassed last season's win and point total when they missed the playoffs for the second straight time. This season under Trotz they are vying for a home-ice advantage to start the postseason. Trotz likes what he sees with just over three weeks left in the regular season. "We're showing poise," said Trotz, who coached the Washington Capitals to the Stanley Cup last spring. "In the playoffs, work ethic and patience are the difference." The Canadiens are battling Columbus for the second wild card spot in the conference. They were coming off Tuesday's 3-1 win over Detroit at home in which Price became the winningest goalie in Canadiens history with victory 315. "We played a team that looked like they're ready for the playoffs. We had opportunities. In the end it was disappointing," Price said. "It's a learning experience. We have to move on."